Posted on July 1, 2017 at 6:39 am. 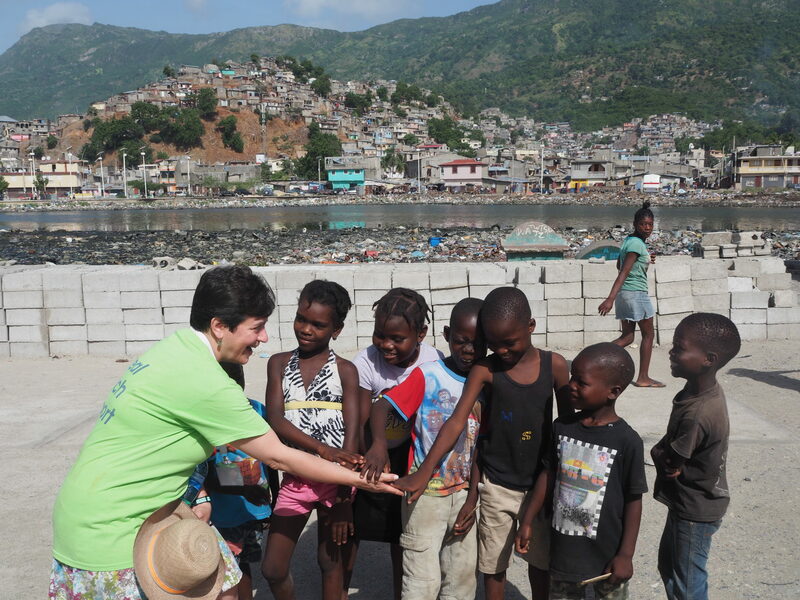 Returning to Haiti always fills me with mixed emotions. 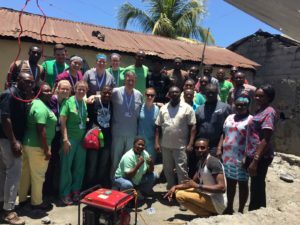 The opportunity to make a difference and positively impact the health and lives of individuals that have so few opportunities to access medical care is an exhilarating feeling for a doctor. The chance to reunite with old team mates, to see the experience through the eyes of first timers, to tell the story once again of some of the amazing life experiences that have occurred on previous trips and to know that something will happen this week that will be equally as powerful keeps me coming back for more. The biggest draw of course is seeing the Haitian people once again: the individuals that you know, that have become a part of your lives, the children you have watched grow, the faces in the crowd that wave to you either recognizing you or not, but just glad to see you there. Then there is the apprehension- knowing that we will see patients with ongoing illnesses that can’t be cured in a day, examining once again other patients I have followed from afar, working to make sure they got the care they needed while being 1000 miles away, patients having limited resources, struggling through barriers of language, money, illness and lack of ability to negotiate the frail system of health care in Haiti, and the patients who we get to too late. For me the story is always complicated and fraught with emotion and challenges. 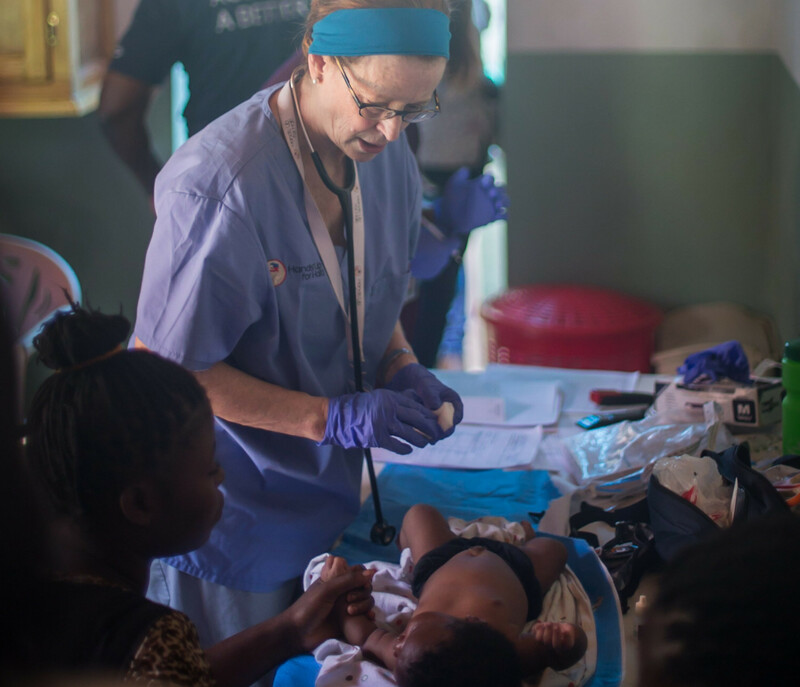 On my previous trip to Haiti one year ago, I saw three critically ill patients, two boys with advanced bone infections, each of whom had been sick for months before the team arrived, one also suffering from severe malnutrition. The third patient was a nine-month old boy, who weighed nine pounds, the size of a two month old in the US. His heart was pounding out of his chest; he suffering from acute malnutrition and was in cardiac failure. His mother had a blank stare on her face, no expression, as if she couldn’t think or do anything about her son’s condition. And she was right. Without cardiac surgery this child would not survive. I looked her in the eye, and through a compassionate translator I told her this was the day we could save her son’s life. What we did that day would be the deciding factor. I’ve gone to Haiti many times in the last seven years. I have seen many sick children. Some get better before the week is out. Some are placed in our malnutrition programs, and some are hospitalized as these three children were. 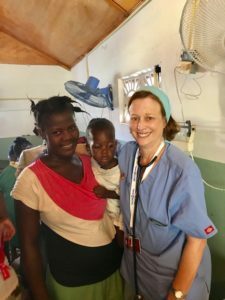 Because of our partnership with Sacre Coeur Hospital, we were able to speak directly with the physicians and ensure the best care possible for these three boys. They would get care. Outcome is less certain. Fast forward. Within one month of being seen by our team, one of the boys died of sepsis, a fulminant infection. The other died in the operating room. I was heartbroken for them and their families: children should not die. But we had gotten to them too late. Their disease was so advanced that treatment and survival was not in the cards. Only Hermano, the little cardiac baby with the ventricular septal defect, remained. It took ten months, many trips to the hospital, delays because of anemia, and then a diagnosis of tuberculosis requiring nine months of antibiotics. 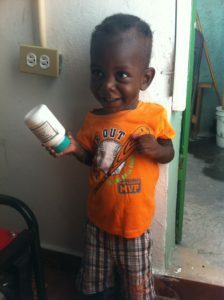 It took all the efforts of Dr. Mary Ann LoFrumento, HUFH’s President and a US pediatrician, and Dr. Dieula Toussaint, HUFH’s in-country malnutrition program medical director, to ensure this child got ongoing care, and arrange for a partnership between Hospital Universite in Mirebelais and Haiti Cardiac Alliance to get him the care he needed. Not only did we need to address Hermano’s other health issues before he could have his surgery, but a birth certificate for Hermano and a passport and visa for both mother and child needed to be obtained. Dr. Manol Isaac, our in-country Executive Director, facilitated this with help from the Director of the Ministry of Health in the North, Dr. Ernest Jasmin. Hermano and his mother were flown to the Cayman Islands in April of this year, surgery was successful and he returned home soon thereafter. Exactly one year after I first told Hermano’s mother that we would help, I stood in the same spot in our small clinic in Shada and again saw this mother and this child, but I did not recognize either one. The mother was smiling, appearing well, and her eyes glimmered as she showed me Hermano, a now thriving child, able to kick and scream the way most toddlers do when they see a pediatrician. Is it enough to save one life? I really don’t know the answer to that, but I know that it feels right. In this world so much is out of our control, the hardship and inequities of rich and poor, those who benefit from health care and those that do not. 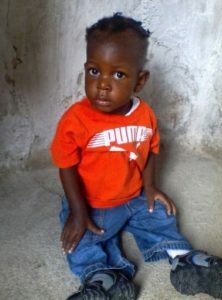 Because of the story of the two boys who died, Hands Up for Haiti has committed to having programs at the remote site of Dondon where those two boys lacked care for so long, and perhaps future children will not suffer the way they did. We continue to work to improve care to those who might not otherwise be reached. For Hermano, our little boy with a whole in his heart, that hole is fixed. As a group, the best of humanity came together and saved this boy from certain death. THE SURGICAL CARE AND HOSPITALIZATION FUND SAVES LIVES. 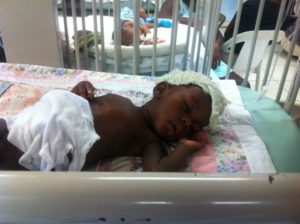 Please reach out with your hearts and your dollars to make the care of these children possible. 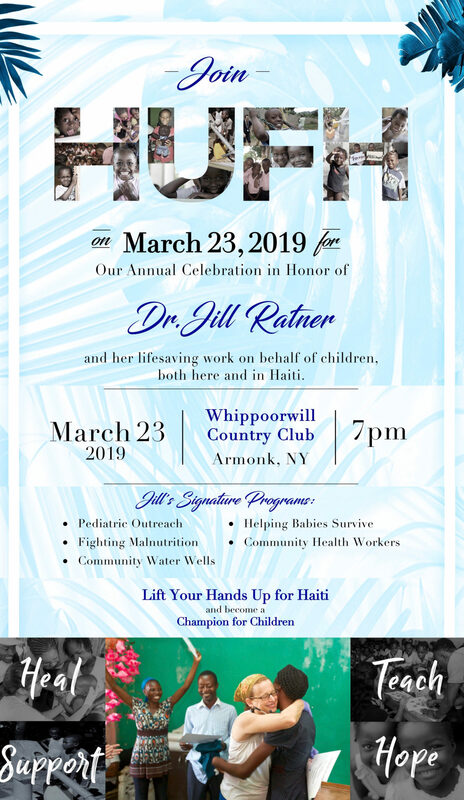 Hands Up For Haiti is a recognized 501(c)(3) organization, and your entire donation is fully tax-deductible to the fullest amount allowed under the law. If you would like to do more, please also share this page or send it to someone you think might want to help support these efforts. 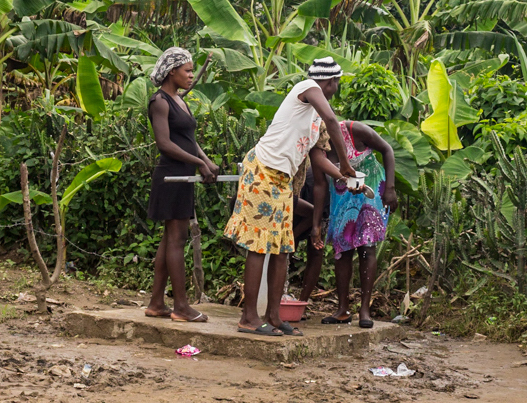 Mesi anpil – Thank you very much for all your support.